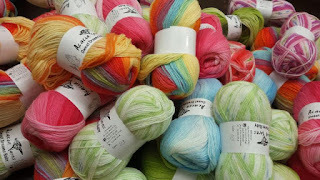 Yarn and Fiber Happenings: Ivy Brambles and Knitting with Friends Join the March Madness Sale at the Yarn and Fiber Company! Ivy Brambles and Knitting with Friends Join the March Madness Sale at the Yarn and Fiber Company! Welcome to The Yarn and Fiber Company March Madness Sale! Every weekday the sale changes at Noon (Eastern Time) so check back daily for great savings on your favorite yarns! Today's sale runs March 12, 2010 at Noon through March 15, 2010 at Noon (Eastern Time). 10% off In-Stock Ivy Brambles Yarns, Roving and Patterns! 20% off In-Stock Knitting with Friends Products! Includes T-shirt, Long-Sleeve Shirts, Tote Bags and more!